Secure inboxes aren’t enough. Anti-malware software isn’t enough. Fraud detection isn’t enough. Physical backup isn’t enough. Can a business IT security strategy ever be enough to counter modern cyber security threats? Some of the challenge is because 91% of hacks start with a targeted email attack, and 80% of security-related breaches are caused by employee behaviour, making them even more difficult for IT to anticipate and guard against. From your inbox to your users, peace of mind comes with four layers of security protection. 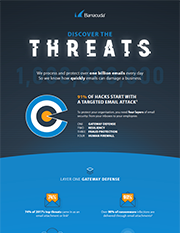 Read more in this ‘Know Your Threats’ infographic.